Our last Why Not Me? Alumni Entrepreneurs event was the best one yet! 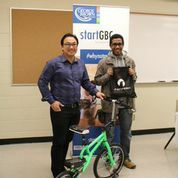 A fabulous group of students and faculty were there to hear Henry Chong, founder of Revelo Electric Bikes, and Jessica Schwartz, founder of Sweet Sushi, talk about their experiences. The two businesses seem very different, yet both agreed on the importance of passion in entrepreneurship, and we found out that both keep things in the family by working with their own sisters! Henry is a grad of the School of Design and Jessica completed the Culinary Management program. We kept things interesting by awarding prizes (very kindly contributed by our guest speakers) to those who asked the keenest questions during the Q & A portion of the event. These were judged by Helene Vukovich, Associate Dean of the Centre for Business. And in addition to sampling sweet sushi, we also tasted delicious refreshments prepared by our own culinary program students. The next Why Not Me? will be held in partnership with George Brown College Alumni Relations Office on May 27. Stay tuned for more information.